a 74 minute sanctuary of slow time and long thoughts. Warm, breathing harmonic waves of sound lay foundations for an evolving array of subtle textures blended to create a sensual sonic environment ideal for infinite playback. Fans of such Roach classics as Structures From Silence and the Quiet Music series are in for a supreme experience . . . This is one long track intended for infinite playback. We often put it on repeat and let it play all night. Dream Circle is a walk through a surreal museum. Rich in detail, sonic artifacts are placed around the room, drawing your attention then moving you on, all in a slow motion state. An ambient music that engages as well as soothes, that focuses the mind more than it massages. What do you call a disc that is one 73-minute song that changes almost imperceptibly over its duration? I call it pure Steve Roach. Originally a 1994 limited edition of 2500 signed copies, it has now been reissued. 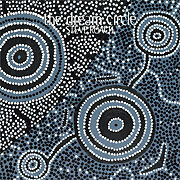 This is well worth pursuing, especially for fans of Dreamtime Return. This is Steve Roach at his organic best. The music breathes in and out slowly, totally draining your body of any tension or stress. There is no didjeridoo, but plenty of deep cavernous echoes, shimmering rain sticks, chirping sounds, and deep, rich bass. There truly is almost no discernible change in the music at all over the course of the 73 minutes, so if you are looking for something that is more complex, look somewhere else. If, on the other hand, you are searching for the perfect music to take your mind and body on a journey to new corners of the universe, look no further. This is perhaps the most perfect relaxation and / or meditation music I have had the pleasure to listen to. I instinctively shift into slowly, deeper breathing, even as I type the words to this review while I listen. What is wonderful about The Dream Circle is that it is very functional, either as an aid to reduce stress, or to focus energy for reading or intense study, or simply as great background music. Highly recommended.